BROKEN ARROW -- The owner of a daycare in Broken Arrow that suddenly closed its doors is accused of doing the same thing in another state. Kids Fun-Damentals has a sign on the door saying they are closed. Families recently paid their October tuition and employees do not have their most recent paychecks. Tiny Tots University in Bend, Oregon shut down one weekend in May of 2005, according to The Bulletin Newspaper. It was owned by Denise Tilley, who at the time went by Denise Ivy-Schafer. Oregon's Early Learning Division said the business never had any violations. Tilley had a daycare operator's license from 2003 to 2005. 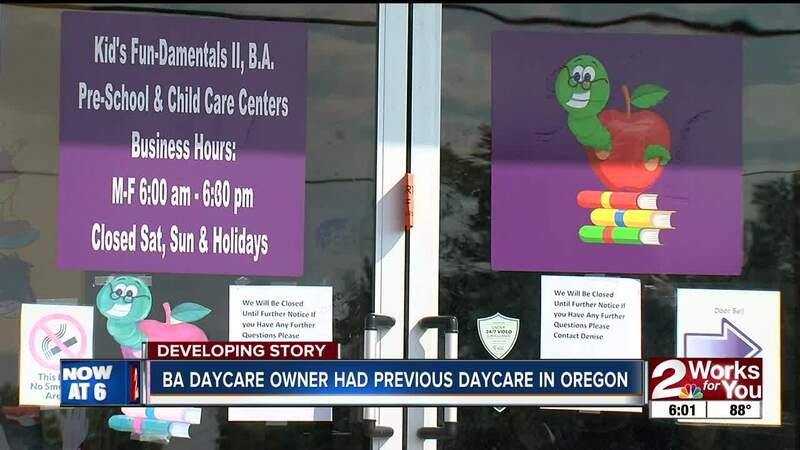 The Bulletin reported at the time the previous owners of the daycare, who lived in another city, were contacted by the state immediately after Tilley shut the doors. They were asked to re-open it. The previous owners said some families had paid for the month of daycare when Tilley closed it. A similar situation happened in Broken Arrow. Families are now calling Tilley's cell phone trying to find out how to get their money back. They have not had success getting in touch with her. Tilley posted in Facebook groups selling furniture from her home. A post of a refrigerator just a few days before Kids Fun-Damentals closed said "Great fridge but we're moving." We reached out to Tilley, but her phone was off.